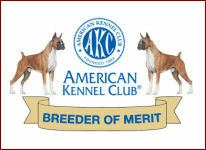 Amity Hall Boxers is proud to be a recognized Breeder Of Merit with the American Kennel Club. We are located on the Gulf Coast of Mississippi. Member of the American Boxer Club, Maryland Boxer Club, and Boxer Club of Louisiana.